What Makes a Great Teacher: Training? Experience? Intelligence? Grit? If a teacher is successful in the classroom, does it matter how she got there, or how long she intends to stay in the profession? Should personal qualities like perseverance and grit count just as much as completing the requisite coursework in curriculum and instruction? Those are some of the questions being asked in the wake of a new study that reflects favorably on Teach For America’s corps members who teach mathematics in schools that have typically struggled to fill teaching vacancies. The study, conducted by Mathematica Policy Research for the U.S. Department of Education’s Institute of Education Sciences, also found that the New Teacher Project's Teaching Fellows, an alternative hiring program, had student gains that were comparable to their peers who entered the profession through more traditional means. Those findings arguably open the door a little wider for discussion of the merits of alternative routes to licensure. Over at Slate, Matthew Yglesias makes a solid point about TNTP being at least as good at picking effective teachers as the traditional training programs that produce the vast majority of the nation’s educator workforce. The TFA aspect of the study looked at middle and high school students at 45 campuses in eight states, over two academic years. TFA corps members work at campuses serving high-poverty, high-need populations of students, many of whom are already lagging academically. 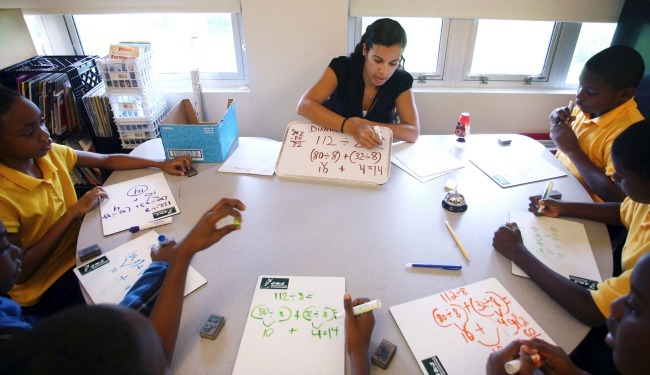 The students of TFA corps members showed more academic growth in mathematics than their peers being taught by teachers who entered the profession via other paths, both traditional and non-traditional. It’s worth noting those findings are in line with prior studies, including a 2011 working paper by the Center for Longitudinal Data in Education Research. As Politico’s Stephanie Simon pointed out in her reporting, “the gains weren’t miraculous,” with students climbing up to the 30th percentile from the 27th percentile. While that’s still well below average achievement, Mathematica’s researchers calculated the improvement was on par with 2.6 months of additional learning time. She added that “so much of the conversation” around teacher quality has focused on how many years of experience are required to be effective and debates over traditional versus alternative pathways toward a teaching license. But “this study shows that even those that are less experienced and didn’t always major in the content area [they teach] are able to produce meaningful and important results,” Beard said. I think it’s their screening and selection process – and in particular the screens for non-reportable traits such as tenacity, sense of efficacy, and belief about children’s potential – that makes the difference … It’s quite different from how labor market issues are approached overall in K-12 education and how most hiring occurs. In fact, it shows how silly and unhinged much of our education debate is that many of the same people attacking TFA simultaneously argue for a greater focus on selection like [insert country du jour here]. Indeed, a frequent criticism of the nation’s teacher preparation programs is that they are not selective enough, accepting students who are often in the bottom quartile of their graduating class. In countries with the highest-scoring students on international exams, such as South Korea and the often-lauded Finland, teachers are drawn from the top quartile (and often higher) of elite postsecondary institutions. Teachers in the United States generally are trained at middling institutions with a low bar for admissions. This is hardly a new issue, although concerns over teacher quality have been finding more of an audience recently. In June the National Council on Teacher Quality released its controversial rankings of teacher preparation programs, the first of its kind. U.S. Secretary of Education Arne Duncan raised concerns about the nation’s “mediocre” teacher colleges back in 2009, and two years later announced plans to offer states incentives to identify and shut down their lowest-performing teacher education programs. Another common complaint is that many TFA teachers don’t stay in the classroom much beyond the initial two-year stint. Villanueva Beard counters that with this statistic: Of the more than 32,000 former TFA corps members, more than two-thirds have remained in education-related fields. In recent years more than a handful of TFA alumni have also landed on state boards of education, or assumed control of entire districts (Michelle Rhee is just one example). While TFA might not be creating a master corps of elite, lifetime educators, it is exposing college graduates, many of whom have already demonstrated leadership potential and an interest in public service, to the challenging realities facing historically underserved populations of students. Ideally, TFA alumni might carry that experience -- and perhaps a more finely tuned sense of empathy -- with them as they moved on in their careers, wherever they land. So does the new study bolster the argument that TFA at a minimum isn’t doing harm? I put that question to Randi Weingarten, president of the American Federation of Teachers, and she made it clear that kind of short-term gain doesn’t override the fact that too many students’ needs won’t be met in the long run.